I was lucky enough to be assigned to Who Needs a Cape? This blog is special because it is run by a group of moms. And "Not Your Average Super Moms," either. These Super Moms all met online a few years, during their respective pregnancies; they've since become great friends, although some of them haven't even met in real life yet. Bevin, Heather, Lori, Rebecca, and Sherry all pitch in with the creation of blog posts, so readers get a fantastic variety of great ideas. Who Needs a Cape? is full of yummy snacks, simple family meals, and delicious desserts. There were lots of recipes that were calling my name: the Triple Berry Quinoa looked like a wonderful, easy weekday breakfast. This Mango Salsa Pulled Pork is just the right balance of sweet and savory. And at some point I'm totally going to tackle their 40 Meals in 4 Hours Crockpot Freezer Meals (their #1 post of all time!). But then...I spotted Heather's Slow Cooker Taco Stew. Now, my husband is positively obsessed with tacos. And a bowl of stew is probably his favorite cool-weather meal. So tacos and stew together? In one mind-blowing meal?! I knew I had to make this for him. Just place everything in the slow cooker and cook on low for six hours. THAT'S IT. So easy, right? And super yummy, too. NOTE: I made a few minor adjustments. I used less celery and more onion, and I substituted a jar of salsa for the can of tomatoes. Just little tweaks to make the meal an even better fit for my family's taste buds. I'm sure this would also be great with some chopped bell peppers, or maybe a jalapeno for some heat. Instead of topping it with cilantro (I'm one of those people who are genetically predisposed to hate the stuff), I topped my bowl of stew with diced avocado and chopped scallions. They were the perfect, fresh accompaniments to the tender, tasty, hot stew. And, of course, my husband loved it. "This is definitely going into the dinner rotation," he proclaimed. I am really loving the sound of this! 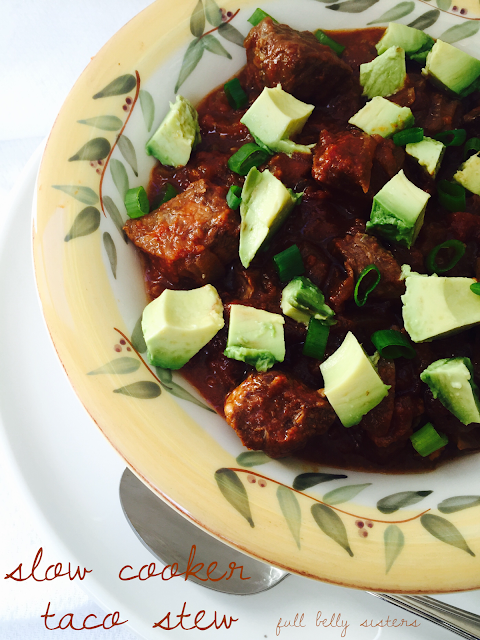 SO fun to have tacos in a stew form! It really is a fun dish! Like your hubby, we too, love tacos and stew! What a great recipe idea!! 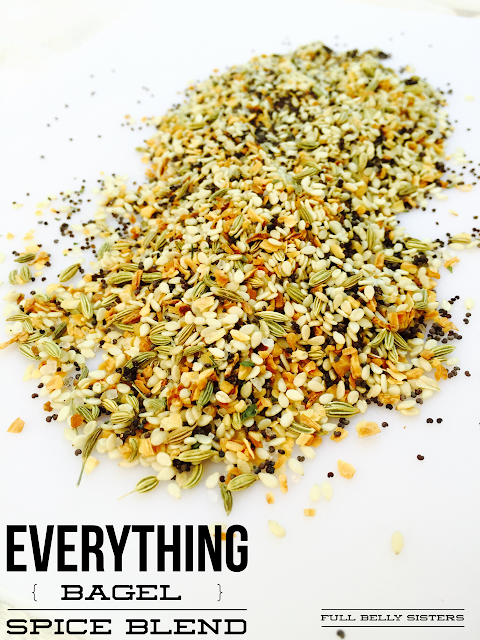 Thank you for being a continued part of our recipe swaps! I so love having you in our group! First, I am so glad I am not the only one who does not like cilantro! Second this has been so much fun and I love the recipe. How easy is this? Great weeknight meal for families. Haha, I'll eat all the avocado you don't want and you can have my share of cilantro! What a great recipe. My husband will love it too! And thanks so much for linking to my taco seasoning! It's one of my favorites! pinning this for later! Great, hope you and hubby like it! What a great idea to take this south of the border, love it! We really did—thanks for the inspiration! Simple recipe and this sure looks like it is packed with flavor! My family will devour this dish. Great recipe! Wow this looks SO good! 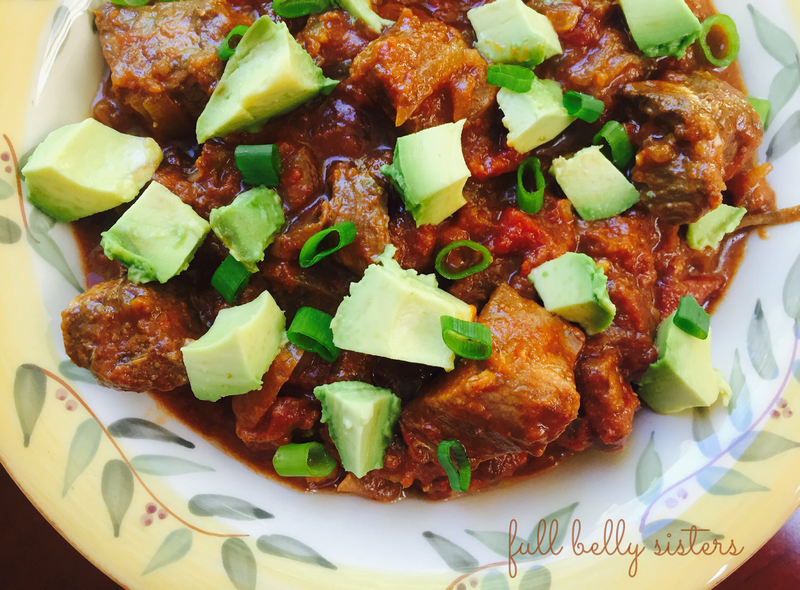 I have a package of stew meat in the freezer and I think this might be just the way to put it to good use! I am so making this! 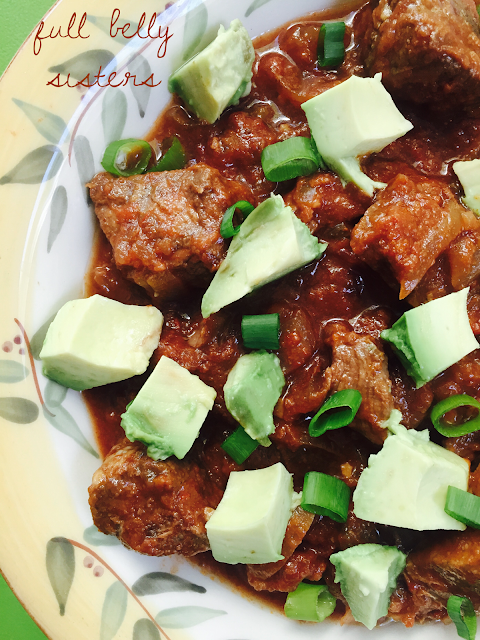 My family LOVES tacos and stew is just the ultimate comfort food when it's cold outside! I totally agree, perfect fall/winter dinner! We love tacos!! Definitely need to make this - It looks so hearty and comforting! I love taco soup in the slow cooker. I haven't tried it with stew meat before. I know this is so yummy! This looks like a delicious taco stew. wow! That sounds really yummy! and now that it's finally cooling off in texas, I'm all for a bowl of stew! This was sooooo good! Served it on top of rice with a dollop of sour cream since I didn't have an avocado. It's definitely happening again!